When to start dance classes or ballet? 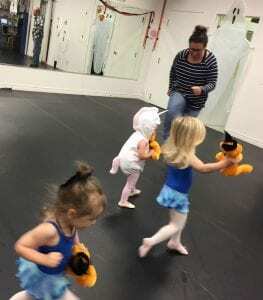 At what age should my child start ballet or dance classes? If your child starts to dance every time they hear music, you probably have a dancer and/or musician. You can start as young as 18 months! At that age teachers work with the gross motor movements of walking, marching, creeping, running, jumping and turning. At Fleet-Wood Dancentre we add shakers, tambourines and rhythm sticks to enhance musicality and match movement to “the beat”. We use songs they are familiar with like “Hokey Pokey”, “Twinkle Twinkle”, etc. Lots of variety is key. Around the two or three galloping and skipping emerge with more refined arm and foot movements. They love to mimic and follow well. They can balance on one leg for their first “toe taps”. Jumping skills improve, leaping forward and on the spot. Spins and jumping jacks add to their repertoire. They love to pretend and create their own movements and love the repetition of song and dance routines. A good class needs this mix. Now comes the magic age of 4 and 5. They are ready for technical details. Learning arm and foot positions specific to the dance form, and set coordination. The dance form you choose from can be ballet, jazz, tap, highland, creative dance, modern, salsa or ballroom to name a few. Your child may be particularly drawn to one style more than another. Something they see on TV. A dance teacher can also help you with the best choice. If you have an active child, jazz, hip hop or tap with its upbeat rhythms may appeal more and satisfy their energy. Ballet requires the ability to stand still for periods of time for slow sustained balances and coordinations. But ballet also includes challenging jumps and turns requiring strength, speed and agility. A certain range of motion is desirable in the hip joints for “turnout”. Many a doctor has sent a child to ballet class to help legs that want to “turn in”, straighten out. Ages six, seven and eight are also a great time to start. It is really never too late as the benefits of dance, which trains both sides of the body equally, coupled with the stimulation of benefits of music, can become a lifetime of physical activity with all it’s rewards.